Next month I will be reviewing the Joomla! 1.5 Cookbook by Packt Publishing. This book has the same structure as the Joomla! 1.5 Templates Cookbook I reviewed earlier this year. The book contains over 60 practical recipes covering a range of site management and core Joomla! activities and guides to use several handy Joomla! plugins. 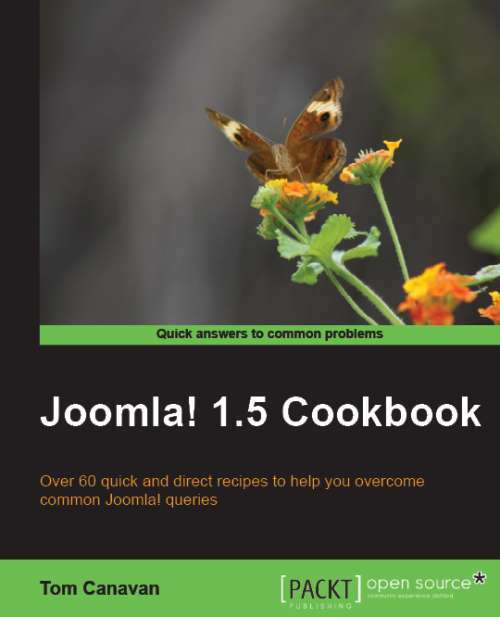 This book is written for beginning and intermediate users of Joomla! 1.5 and 1.6 with or without knowledge about webdesign. Know your way around phpMyAdmin for some of the tasks you may face. Install your template, assign it as the default and make changes to it. Setup the basics of a Section and a Category to hold and manage content with. Install, configure and use of some select extensions. Learn how to do the easy and medium difficulty tasks, designed to eliminate a few of the issues you may experience. More information about the book can be found at Packt Publishings product page. You can expect the review on my site within a month from today.